Thanks in large part to the calming voice and poofy hair of Mr. Bob Ross, to this day I find globs of paint and palates incredibly comforting. So photographing the blue-hued corner of Suzy Barnard‘s studio for my Dogpatchwork project was a pretty great way to spend the morning. My very talented friend Chloé is having a show of her work at La Boutique and I was thrilled to make a little teaser video to spread the word. She creates wonderful, whimsical, colorful pieces with paper that are so worth seeing in person. Get yourself there on the 27th! The artist currently in residence is Lauren DiCioccio , whose work is thought-provoking and beautiful and friendly nature is infectious. Last Sunday, she led an embroidery workshop, at which I happily spent hours at a long table, meeting new people and concentrating on tiny stitches, a pretty impressive feat. Case Study House No. 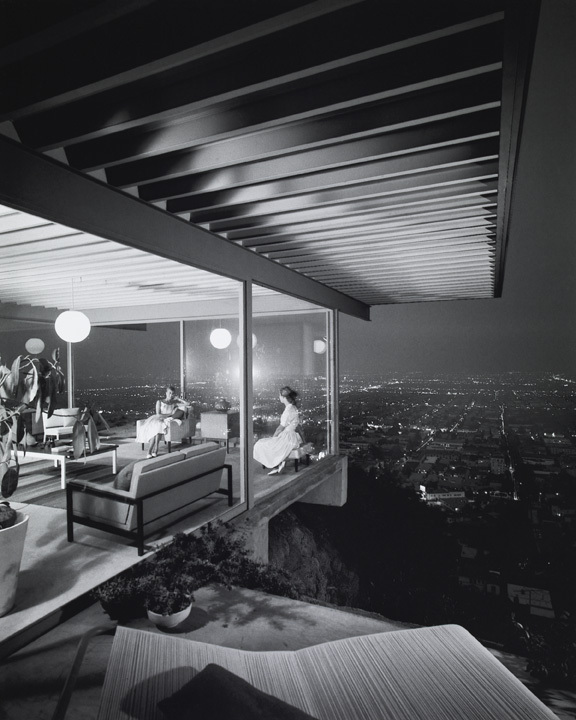 22, Los Angeles, Calif., Iconic Girls, 1960; Pierre Koenig, Architect. As a girl born and raised in the New Jersey suburbs, I’ve spent many an hour in New York’s Penn Station. Sometimes it was good: Waiting for the first weekend morning train with my then-boyfriend and taking a walk around the block at sunrise. Sometimes it was bad: Rushing for the midnight train with the Z100 Jingle Ball concert crowd of pre-teens and their mothers, as they held hands in rows and screeched. Oftentimes it was ugly: Drunken Rangers fans after a loss, the dim, sad lighting in the underground station and the insane look in people’s eyes when the track for their train is posted. Yet, with all of these associations, I was still thrilled to come upon this video of Jorge Colombo‘s finger painting of Penn Station. The New Yorker‘s use of Colombo’s paintings, all done through an iPhone app, is old news to most now, but they continue to delight me and the discovery of these videos showing the process was especially thrilling. At my university, all art majors were required to take an “Art in 3D” course, to ensure, I suppose, that we emerged with a well-rounded art education. I stumbled my way into photography and have never claimed to have much artistic skill without a mechanical aide, so this was quite a challenge for me. Yet, somewhere amidst the insanity of building an extainer and carving a plaster suitcase, my professor introduced me to the work of the German architect and structural engineer Frei Otto and for that I will be forever grateful. All images from Mr. Otto’s website.